Photographic Museum of Humanity is the first online museum dedicated to photography. Every year its team of photographers and filmmakers travels across South America to spread the project and explore the relationship among photography, cultures and contemporary society. 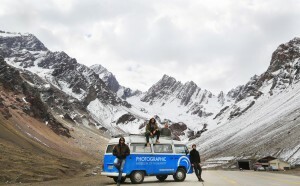 In March 2014 they drove 6,000 km across Chile on the Museum Van. They crossed the Andes, reached the Pacific Ocean and passed through the Atacama Desert. This is a documentary about the people, moments and stories they met on their way. CLAN – It’s a duo of young directors composed of Nicolas Uboldi and Federico Telerman. They have a contemporary and modern aesthetic but also super quality. With an extreme sensitivity to tell stories from the image and beauty and a fresh and sensory style. Their lastest works participated in festivals such as the Miami International Film Festival, the Sci Fi London, to name a few. They direct and write audiovisual material with basis on Buenos Aires, Argentina.